Using computer-controlled MITEK component saws, L&L can quickly and precisely cut lumber. These component saws are equipped with up to five saw blade heads which adjust individually to all required angles or cratering. 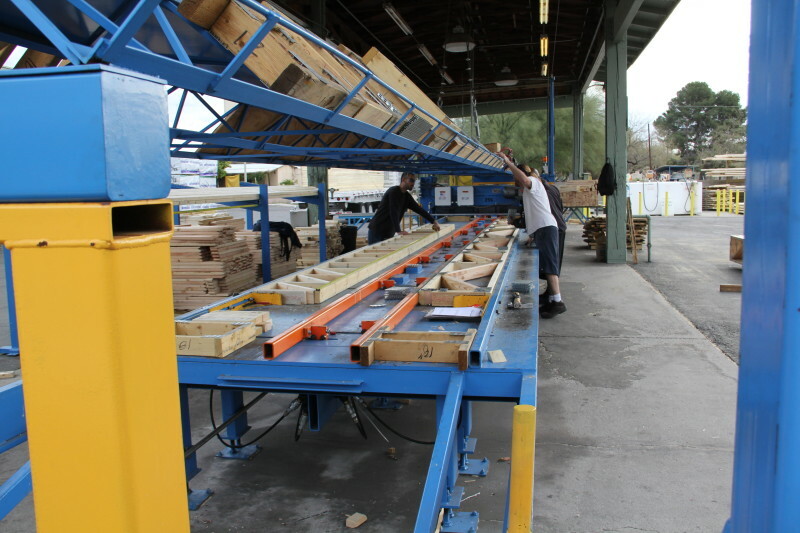 Lumber is fed into the saw conveyer where each saw blade head cuts the predetermined angle and discharges the final product out the opposite side. These component saws enable one sawyer to process a large volume of components in a short period of time. In two of our buildings, we use four MITEK roller tables, each having a preliminary traversing roller that partially presses the plates at the point of assembly. This enables the truss to be transfered to a conveyer system that finalizes the plate press operation. Trusses are then stacked and banded for shipment. When trusses are too large for roller tables, we rely on two A-frame gantries to accommodate trusses up to eleven feet high. The machines have a single hydraulic press head suspended under the cross trolly beam that can be positioned to press plates into components jigged into special magnetic stands. The gantry framework is traversed in all directions via hydraulic motors controlled by operator buttons. Each gantry has a 2-man team. Floor truss production is accomplished with a MITEK roller system similar in operation to the roof truss roller but has a jig framework unique to the shape of floor trusses. The plates are pressed only once by use of a traversing roller which passes over the full length of the truss. Each truss is flipped over into another jig across the table where plates are applied to backside and pressed. The “back-plating” is being performed at the same time a new truss is again being assembled and plated on the opposite side of the table.